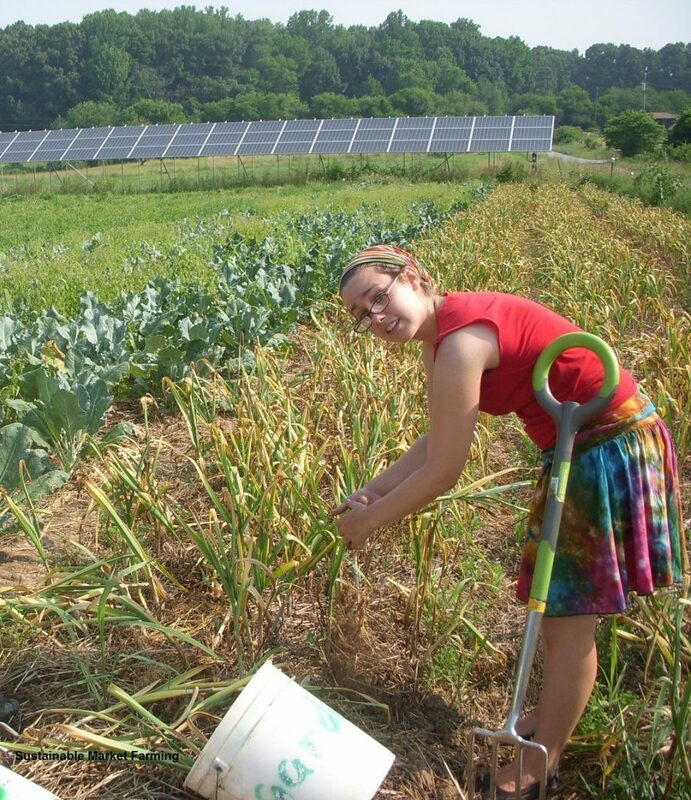 Here’s my updated slide show Sustainable Farming Practices (for Vegetable Growers). You can view it right here, clicking on the white arrowhead, or you can click the diagonal arrows to get a full screen version. This is the second workshop I presented at the Carolina farm Stewardship Sustainable Agriculture Conference. The handout for the workshop is on the CFSA website as a pdf. We’ve just completed our annual Crop Review meeting. We prepared a spreadsheet of all the crops we grew, when we planted them, what varieties and so on. We went down the list alphabetically and shared what we could remember about how well each planting did. I’ve written about this process a couple of years ago, in my book, and also in Growing for Market magazine back in December 2007. This year we had a hard spring, with El Nino. Cold wet weather prevented us planting everything we planned to. We didn’t grow spring potatoes or turnips this year. We did sow snap peas but I think they all rotted in the ground. We had good spring crops of carrots and beets (once germinated, things grew well!). Our spring broccoli and cabbage were good, but our fall ones got lost in weeds, when we didn’t have enough workers. We failed to get a timely delivery of the pedio wasps to deal with the bean beetles, and our beans had low germination rates this year. Our sweet corn did well all season, after the flooded end of the first sowing was forgotten. We had plentiful cucumbers, and enough zucchini and yellow squash; our leeks this winter are the best ever (thanks to attention to weeding, and to side dressing with compost in the late summer). The lettuce supply was good all through the spring and early summer, and is great now. We lost lettuce to cutworms in August. Okra was very abundant, as were eggplant – the hot summer was good for them. Our peppers did well, our Roma paste tomatoes were a bust, mostly because we didn’t keep up with string weaving. Sweet potatoes and June-planted potatoes yielded poorly. Our cherry and slicing tomatoes did well, but came to an early end. The fall greens (kale, spinach, collards, senposai, Yukina Savoy, turnip greens) are now doing really well, after an early battle with baby grasshoppers. 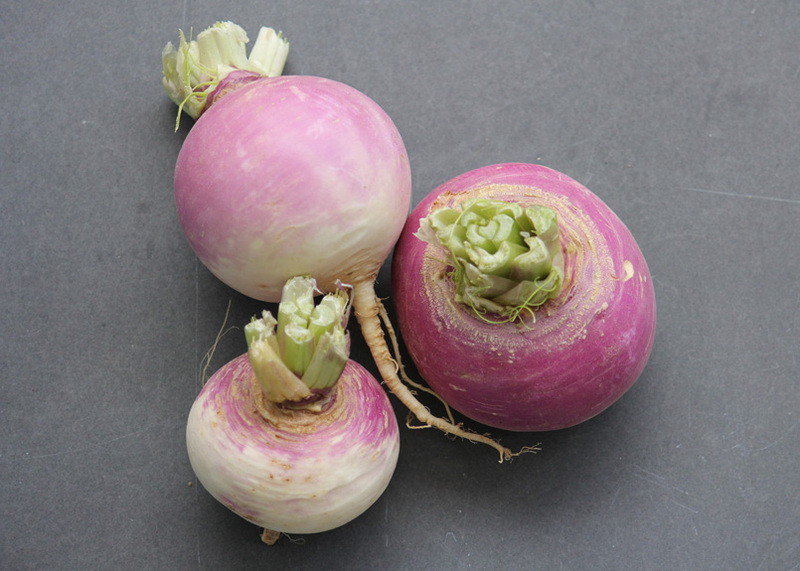 Our fall turnips are the best in many years. 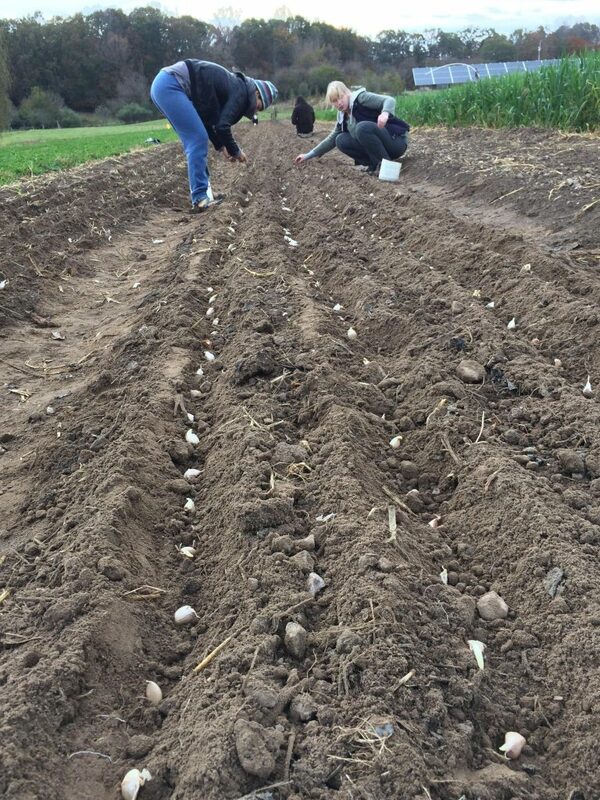 At the Crop Review meeting we popped our hardneck garlic bulbs apart for planting. On the next two days we planted that (3180 row feet). The day after that we popped our softneck garlic and planted that (1080 row feet) and also planted all the reject tiny cloves for garlic scallions. 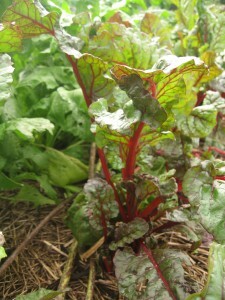 Click the link to read about growing and harvesting these yummy spring treats. 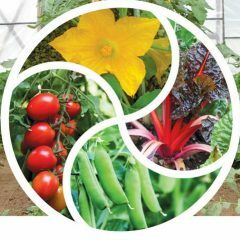 We’re up to date with preparing for the end of garden shifts and the transition to one person each day taking care of the hoophouse, greenhouse, weather station and harvesting the remaining outdoor crops. We’ll work that way until the end of January, and then start pruning blueberries and grapes. We have been harvesting our hardneck garlic for the past week, and the end is not in sight! Back in November, we accidentally planted more than we intended. I can’t remember now if our planting schedule had the numbers wrong, or the planters misunderstood the schedule. Anyway, we intended to increase our ratio of softneck:hardneck, but ended up planting the same amount of softneck garlic as in recent years, and more hardneck than we had grown for at least three years.Those good at math will already realize this means we decreased our ratio of softneck:hardneck! Garlic hanging in netting to dry and cure. Very hard soil can damage the bulbs, so water the night before If the soil is very dry,. Plan for an average of 15 minutes per 5 gallon bucket for digging up garlic and 15 minutes per bucket for hanging it up. Bruised bulbs won’t store well, so treat the bulbs like fragile, sun-sensitive eggs. Don’t bang them together, or throw or drop them. Use digging fork to loosen the bulbs, without stabbing them. Don’t pull on unloosened garlic, as that damages the necks, and they won’t store well. Don’t rub or pick at the skin. To store well, bulbs need several layers of intact skin. Air above 90F can cook garlic bulbs, sun can scorch them. So don’t leave them out on the beds. Put them gently into buckets or crates angled to shade the bulbs. No matter how dirty they are, don’t wash the bulbs. They need to dry out, not get wetter. The dirt will dry and fall off later, or if bulbs are not clean enough for market, the soil can be gently brushed off. Keeping the containers shaded, load them on carts or a truck and take to your barn for drying. It’s important not to leave garlic in plastic buckets for long, because of condensation. We like our garlic arranged in order of harvesting, to make it easier to find dry garlic when the time comes to trim it. We hang our curing garlic in vertical netting hanging around the walls of our barn. 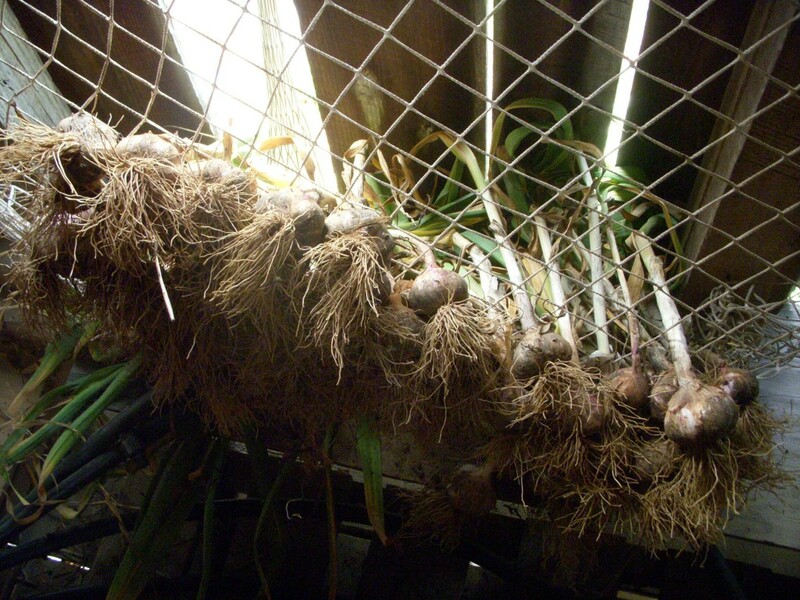 Some growers use horizontal racks, others tie garlic in bunches with string and hang the bunches from the rafters. 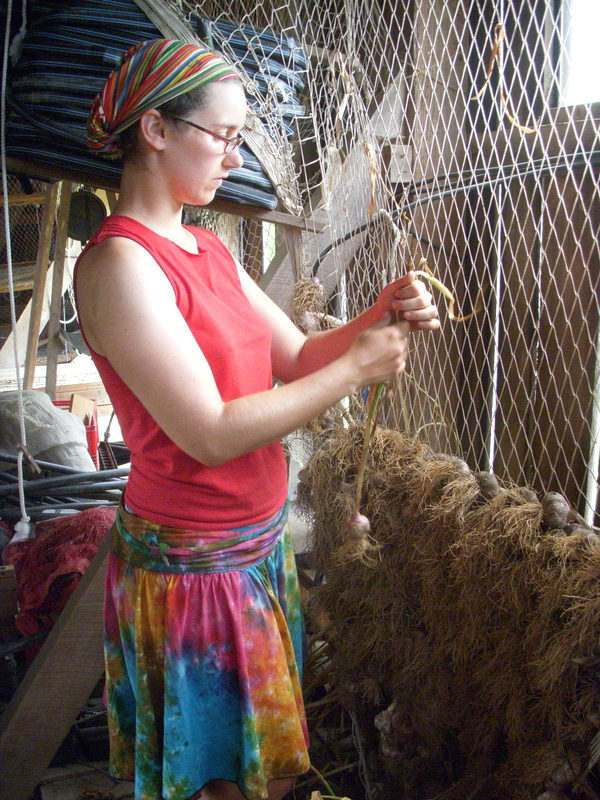 We start at knee height, threading one garlic plant in each hole of the netting. (The netting stretches downward with the weight of the garlic. Starting lower would lead to garlic piling up on the floor.) Take a garlic plant, fold over the top quarter or a third of the leaves, and push the leafy part through the netting. The leaves will unfold behind the netting. Leaves shouldn’t poke through to the front. 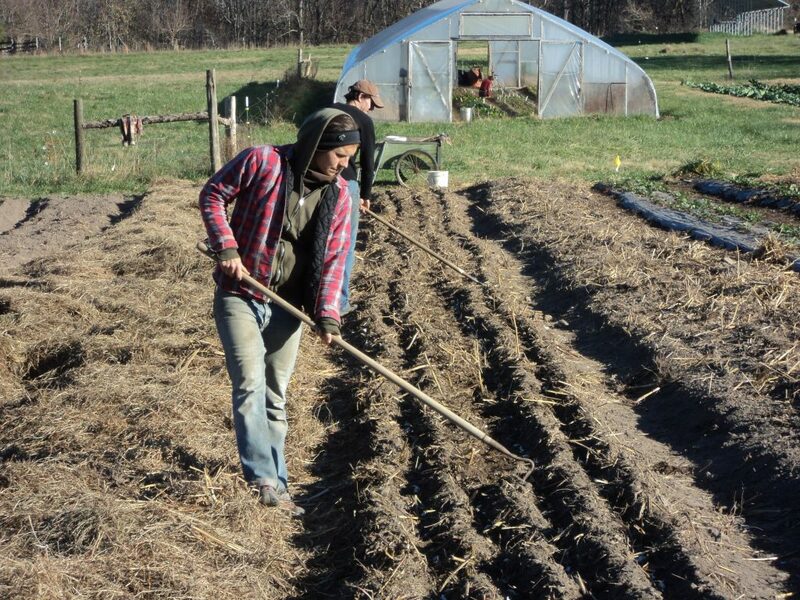 We work back and forth in rows, filling a 4-6 ft wide strip per person, working upwards. We continue as high as we can reach before moving to the next section. We make walls covered with garlic, day by day until done. This sequential arrangement simplifies trimming, and makes the best use of the fans, giving the garlic the best chance of drying evenly. 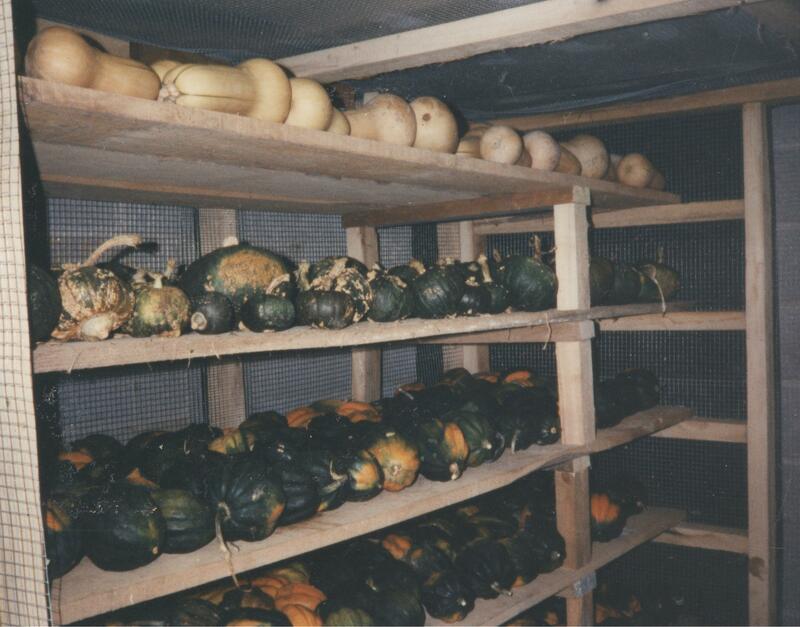 Damaged bulbs are “Farm Use” quality and are set on horizontal racks to dry. Arrange box fans to blow on the drying garlic. Even in an airy old tobacco barn, fans are essential in our humid climate. Wait 3-4 weeks, then test some bulbs for dryness by rolling the neck of the garlic between your finger and thumb. It should feel dry, papery, strawy. If many bulbs are slippery, gooey, or damp in any way, delay the trimming until at least 90% of the necks are dry. Do you cure your garlic upstairs in a barn or on the ground floor/first floor? Do you think one is better than the other in terms of airflow? Is any extra airflow worth the extra hauling garlic up and down stairs? We have been drawing floor plans and making scale models, and thinking about storage of tools, seeds and supplies. Does anyone have a good solution for storage of rolls of agricultural fabrics? We roll our shadecloth, rowcover and insect mesh on 5 ft sticks. We’re thinking of slightly inclined shelves (or arms) with adjustable height settings. We want to be able to see what’s what and to keep various different types of fabric separate, rather than in a big heap as at present. If anyone knows a good book or web resource on storing garden gear, please leave a comment. Using existing ideas beats reinventing the wheel! My blog post for Mother Earth News Organic Gardening blog, about growing sweet potatoes is out. Our plants this year are looking good. I appreciate how much delicious and nutritious food sweet potatoes provide for so little work! 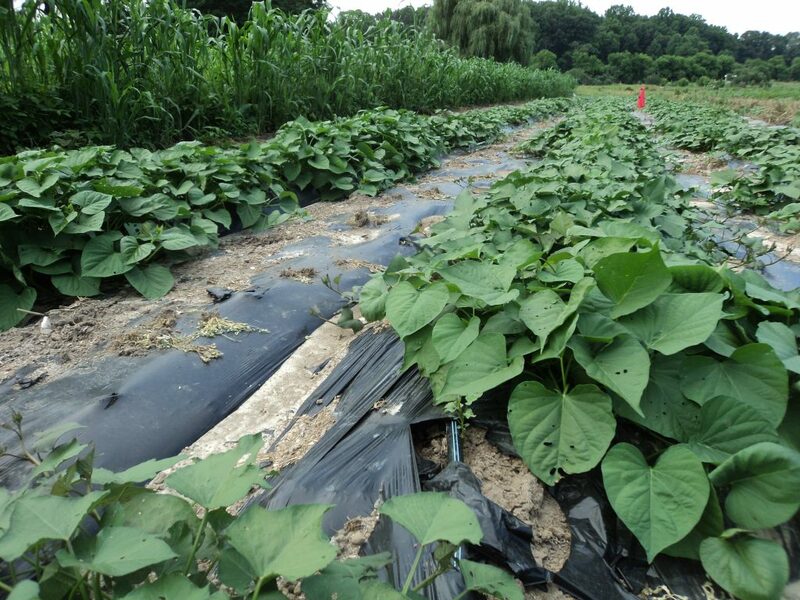 Sweet potatoes growing on biodegradable plastic mulch. Hanging garlic in vertical netting. Today we finished harvesting our garlic. It’s a good feeling to have it all safely hanging to cure in the barn. Our climate is humid so we use lots of box fans to help the drying process. We started harvesting our hardneck garlic about ten days ago, and worked on that (among other tasks) for 4 or 5 days. We were short of workers, so progress slowed, and the softneck garlic took us parts of 5 days too, although there is much less of it. We grew 2880 feet of hardneck and 1080 feet of softneck.. This year’s crop looks good, both in size and condition. In about three weeks, when the necks are dry, we’ll start trimming, sorting and storing. In our enthusiasm, we decided to grow more softneck next year, 1520 feet, and a little more hardneck, 3200 feet. The latter is just because the crop rotation brings the garlic to the central garden next year, where the rows are 200 feet long, compared to 180 feet in our west garden. This leads directly into my next topic: fall crop planning. We are past the peak of planting things now. In the row crop areas we have the summer-planted potatoes, three more sweet corn sowings, and several more rows of beans, squash and cucumbers to go. The area in permanent raised beds will still see quite a lot of changes, and yesterday afternoon, while it was 97F outside, several of us sat down indoors to plan the raised bed crops until the end of 2015. 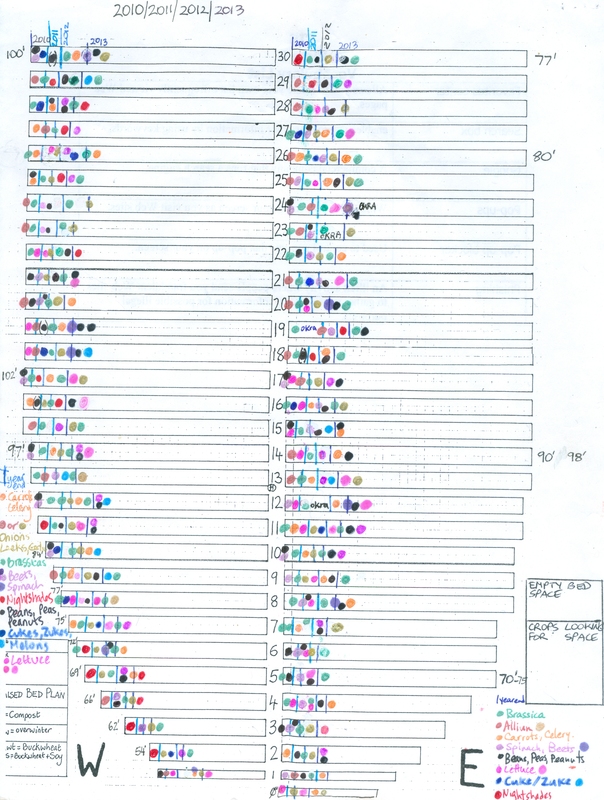 It’s a map of our raised beds, with a colored dot for each crop grown, and a vertical line for each Winter Solstice. It’s a visually easy way to check if any given bed has had, say, brassicas in the past few years. A lot of information in a small space. We started with the carrot family, as we usually grow up to 10 beds of carrots in our 60 beds in any given year. This year our first three beds did very well, so then we skipped a couple of plantings. We have one new bed of carrots, sown in late May. We decided to skip the next two Carrots are only sown here in June and July if we really must – hot weather carrots just don’t taste that sweet. We agreed to do our usual big planting of fall carrots on August 4th, in the row crop plot where we’ve just dug the garlic from. Hopefully we can grow a round of buckwheat between now and then. 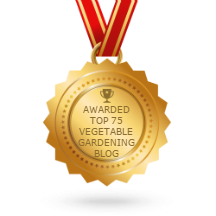 We were persuaded by a carrot enthusiast to grow a bed of over-wintered carrots, which we haven’t done for a couple of years. it’s a bit risky, they could all freeze to death. But if they don’t die, they are so delicious! Next we moved on to the brassicas. Nothing new here. We debated the pros and cons of turnips, and the pros won, so we’ll do two beds of turnips. We raised the question of kohlrabi – no-one keen. Beets and spinach next – we all love those. This group challenges our rotation, because we grow so much winter spinach, and spring and fall beets, and a bed of Swiss chard, all to be taken into account. Alliums next. As I said, we decided on more softneck garlic. On to legumes. No cowpeas this year. No late successions of edamame. As usual, we’ll grow our last succession of green beans in our raised beds, where access is easiest, soil drains quickest, and we can keep an eye out for problems as the weather gets colder, and perhaps windier. We also plant our last successions of slicing cucumbers and summer squash and zucchini in the raised beds too, for the same reasons. It also lets us get the big row crop areas put into cover crops in a timely way. A bed of young transplanted lettuce. The planning task ends with finding homes for our last three beds of outdoor lettuce for the year. We plan these last because lettuce is such a quick turnaround crop, and only needs short-term openings of space between other crops. We transplant 120 lettuce roughly each week, fitting three plantings into each 90 ft long bed. After that we transplant into our greenhouse (until spring when we need the space and the compost they’re growing in, for our spring seedlings). 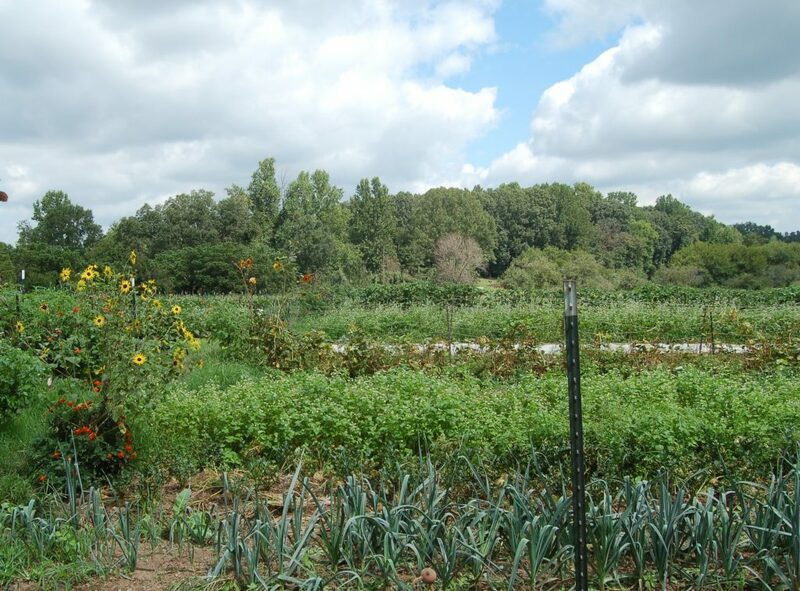 Lastly I want to mention a post I saw on Growing Small Farms by Debbie Roos in Chatham County, North Carolina. It’s about the tomato bug, a pest newly discovered there. It can do a lot of damage, so I, for one, will be keeping my eyes open for any sign of it arriving here in central Virginia. Click the link for lots of good photos and information about this pest. This website is a great source of information, and includes Farmer Resources, Web Resources, Crop Production and Pest Management. Too much rain! But garlic scapes to cheer us up. 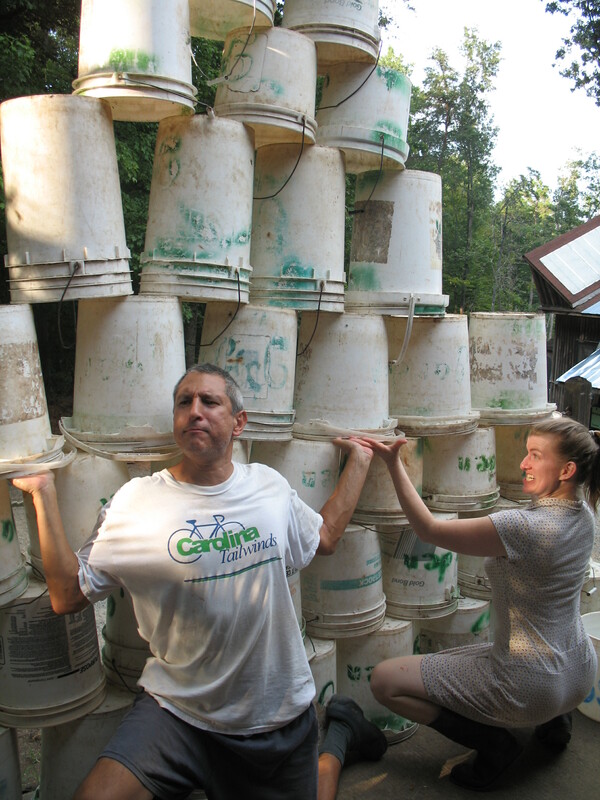 Having plenty of 5 gallon buckets is important. We had 4.6″ rain over a few days and nights. We had to dig trenches across the potato patch to drain out the water, which had reached the tops of the hills (thank goodness we got the first hilling done before the rain!) We also dug “:flood abatement” ditches at the low end of our raised bed area. Even so, we have been really restricted in where we could work. I tell people to harvest or weed at the dry ends of the beds, and back out as soon as their feet start to sink in mud. I don’t want us to compact the soil and make future drainage worse, and give the roots have a hard time growing. To use the rainy weather, we washed our work gloves and started tackling our “Stuck Buckets” stacks. I don’t think we unstuck any at all last year. We had about 50 or so stuck in pairs or triplets. After wrangling them and trying various back-muscle-risking maneuvers, we run them through our commercial dishwasher. When the plastic is hot, the wet buckets come apart more easily. 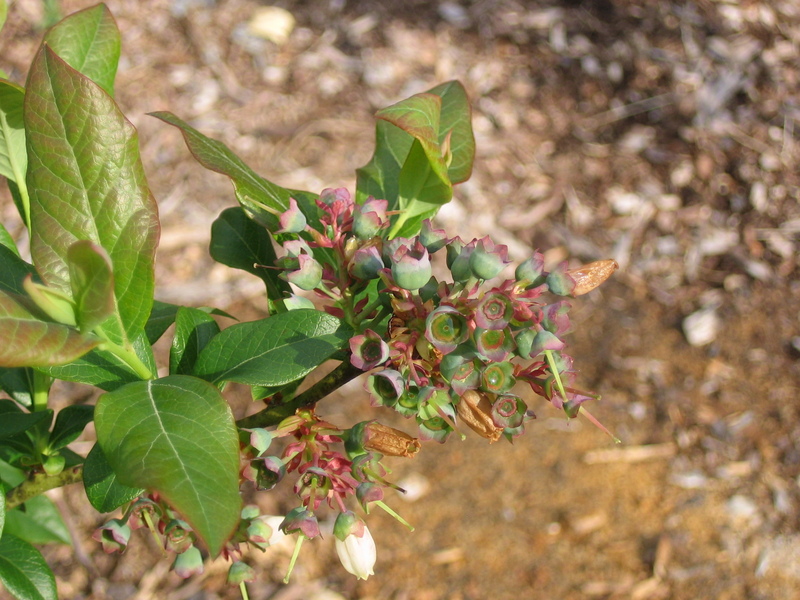 Blueberry bush with green berries. We’ve had to be creative in finding work we can do. Tempting as it is to take a big nap, I know we will be scrambling later, as soon as it warms up and dries out. So yesterday we put our blueberry netting up. The berries are still green, in some cases they are still blossoms, but it’s one job we won’t have to do later. We’ve also pre-emptively been organizing our drip tape and setting up systems we won’t need for at least a week. This is how we usually sow our leek seedlings in an outdoor nursery bed. We’re also starting our leek transplanting. Normally we do this in early June, but this year we sowed our seeds in flats rather than in an outdoor nursery bed, and the plants are big earlier, especially the faster growing King Richard and Lincoln. So we’re going to transplant those today. They are nice and cold-tolerant (we’ve got a forecast low of 34F in a few days! ), and will keep us from putting tomato plants out too early and regretting it later. Starting to harvest garlic scapes lifts our spirits because it is a tasty attractive new crop for the year, and pleasant work. Here’s what I wrote about them for my book, Sustainable Market Farming (c) Pam Dawling 2013. Garlic plants in late spring. Garlic scapes are the firm, round seed stems that grow from hardneck garlic and start to appear three weeks before harvest, as the bulbs size up. If these are removed, the garlic bulbs will be easier to braid, if you want braids from hardneck varieties. Scapes also make an early-season visually attractive crop. Contrary to ideas mentioned by some sources, leaving scapes in does not increase the storage life of the garlic. Most people who remove scapes cut them where they emerge from the leaves. We prefer to pull ours, to get the most out of them. We don’t wait for the top of the scape to loop around, as the scapes will have begun to toughen and reduce the final yield of the garlic. As soon as the pointed caps of the scape have cleared the plant center, grasp the round stem just below the cap and pull slowly and steadily vertically upwards. The scape emerges with a strange popping sound and you have the full length of the scape, including the tender lower portion. Sometimes the scapes will snap rather than pull right out, but the remainder of the stem can be pulled next time, when it has grown taller. We gather into buckets, with the scapes standing upright, so we can put a little water in the bucket and the scapes are aligned, easy to cut up. They will store well in a refrigerator for months if needed. Late morning is a good time to pull scapes (or early afternoon). The wound heals over in fifteen to twenty minutes in the heat of the day, whereas otherwise it could drip for up to 24 hours, increasing the risk of disease, and losing water from the plant. We harvest scapes two or three times a week, for about three weeks in May. The crew always enjoys this task, partly because it’s a stand-up job and partly because we encourage a friendly competition to see who can get the longest scape of the day. This encourages everyone to perfect their technique too. Scapes can be chopped and used in stir-fries, pesto, garlic butter, pickles and other dishes in place of bulb garlic. They can also be frozen for out of season use. Searching the Internet will reveal lots of recipes. Scapes sell in bunches of six to ten. 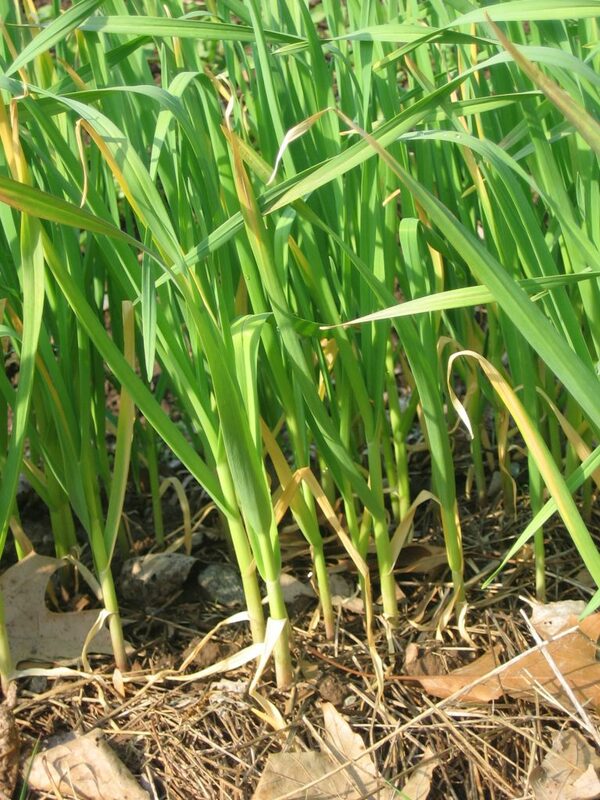 One acre (0.4 hectare) of hardneck garlic can produce 300–500 lbs (140–225 kg) of scapes. Author farmerpamPosted on May 10, 2013 Categories This week in the gardenTags blueberry netting, drip tape, flood abatement, garlic scapes, hardneck garlic, King Richard leeks, leek seedlings, leek transplanting, Lincoln leeks, potato growing, Pulling not cutting garlic scapes, Rain, softneck garlic, soil compaction, storage life of garlic, tomato plants, Virginia weather, when to harvest scapes, yield of garlic scapes1 Comment on Too much rain! But garlic scapes to cheer us up. 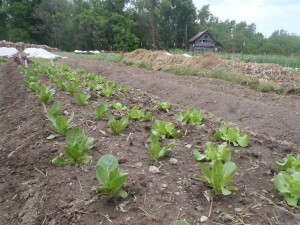 Lettuce Factory: Sow lettuce in hoophouse, for January transplants. 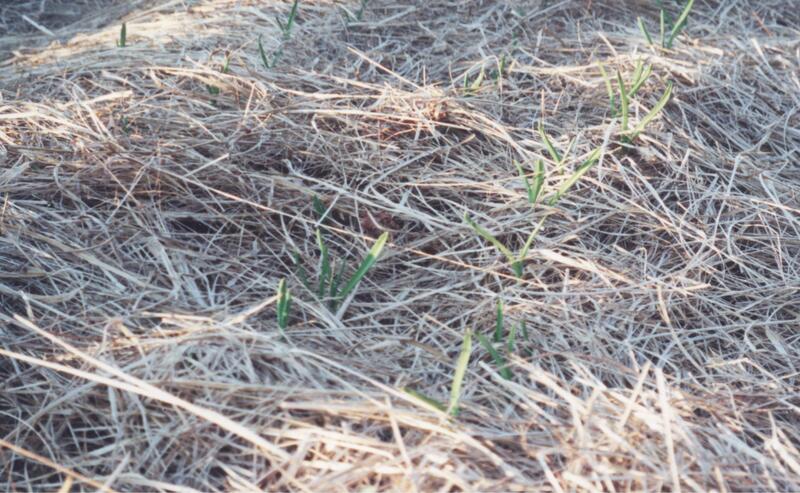 Early November: Finish up sowing cover crops in Nov. Can sow winter wheat in early November (won’t winter-kill). Sow wheat or rye in carrot beds by 11/30(? 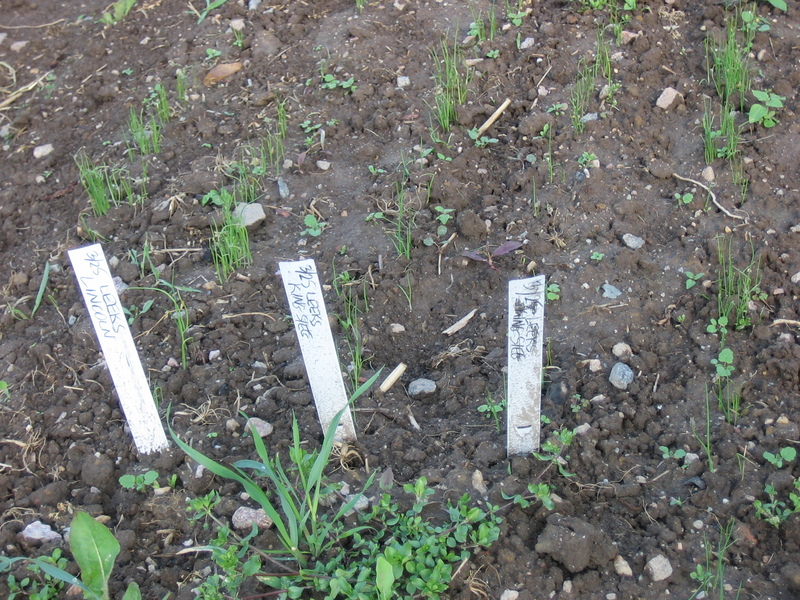 ), or if too late for cover crops, just spread carrot tops on beds. Sow onions to overwinter in hoophouse. 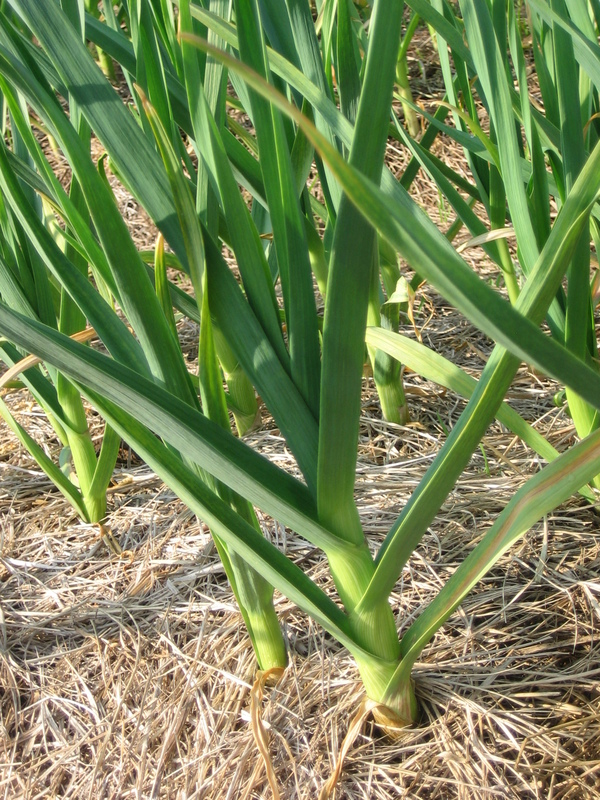 Plant hard-neck garlic when soil temp at 4″ deep is 50°F, and mulch immediately, not too thickly. Plant leftover small garlic cloves for garlic scallions and garlic greens. Potato onions: till beds. 11/1-12/1: Plant medium-size (1½-2” diameter) potato onions, at 6”, or wider if supply is limited. Cover with ½-1” soil, then mulch. If planning a January planting of small potato onions, prep bed and roll mulch now. Sow spinach (for spring harvesting) in early November if not done already. Mid November: Free trapped garlic shoots from over-thick mulch, when 50% emerged. Cover lettuce, spinach (“burns” below 10°F), celery, zukes & cukes and Chinese cabbage. Use double hoops for the spinach, celery, and the last lettuce bed. Harvest: celeriac (hardy to 20°F), beets (15-20°F), turnips(20°F), kohlrabi (15°F), winter radish (20°F), rutabagas (OK to 20°F), carrots (12°F), parsnips (0°F) in that order. Wash and store in perforated plastic bags in walk-in cooler. Record yields. After curing, store boxes of sweet potatoes in basement cage (55-60°F, 80-90% humidity). Sort white potatoes in storage 2 weeks after harvest. Spread lime or gypsum as needed, referring to soil analysis results. Potato Onions: sell small ones (<1½”) or store on racks until January. Ideal conditions 32-40°F, 60-70% humidity, good ventilation, layers < 4” deep. Do not seem to suffer from freezing. Winterize the rototillers and BCS mower. Week 1: Check the accounts and prepare Budget Requests for economic planning. Write Informant. Revise Seed Inventory spreadsheet. Week 4: Seed Inventory: proof reading, etc. File notes. Perennials: Cut dead asparagus tops with weed whackers or machetes, and remove all ferns. Weed strawberries and spread sawdust in aisles. Weed and fertilize rhubarb, blueberries, asparagus, and spread cardboard and sawdust, (hay for asparagus if possible). Weed grapes, take vine cuttings. Transplant new blueberries if needed. November Harvests: last outdoor lettuce (hardy to 15°F with rowcover), beets (15-20°F), broccoli (25°F), cabbage (12°F), cauliflower, celeriac (20°F), celery (15°F with rowcover), chard (10°F), fall greens, collards (5°F), fennel (25°F), kale (0°F), kohlrabi (15°F), komatsuna (15°F), leeks (fall leeks hardy to 12-20°F, winter ones to 5°F or lower), parsnips (0°F), scallions (25°F), senposai (12°F), spinach (0°F), tatsoi (10°F), turnips (20°F), yukina savoy (10°F). Perennials: see November. Cut fall raspberry canes (after leaves have dropped) with pruners, to the ground. Weed raspberries. Hang blueberry drip tape in the branches. Dig docks from asparagus patch. Plant medium potato onions, if not done in November. Drain and store the hoses and irrigation. Clean up stakes, labels. Week 1: Prepare seed order spreadsheet. Decide seed order. Week 2: Revise Lettuce List, lettuce Log. Spend last of money. Check expenditures and spend remaining budget. File the year’s accumulated notes. December Harvests: cold frame spinach or lettuce, cabbage (hardy to12°F), celery (15°F with rowcover), chard (10°F), collards (5°F), kale (0°F), komatsuna, leeks (fall leeks hardy to 12-20°F, winter ones to 10°F or lower), parsnips (0°F), senposai (12°F), spinach (0°F), yukina savoy (10°F).